Is Boston’s Wayfair the next Amazon? Wayfair cofounders Steve Conine (left) and Niraj Shah stood near their desks at the Internet retailer’s Back Bay headquarters. 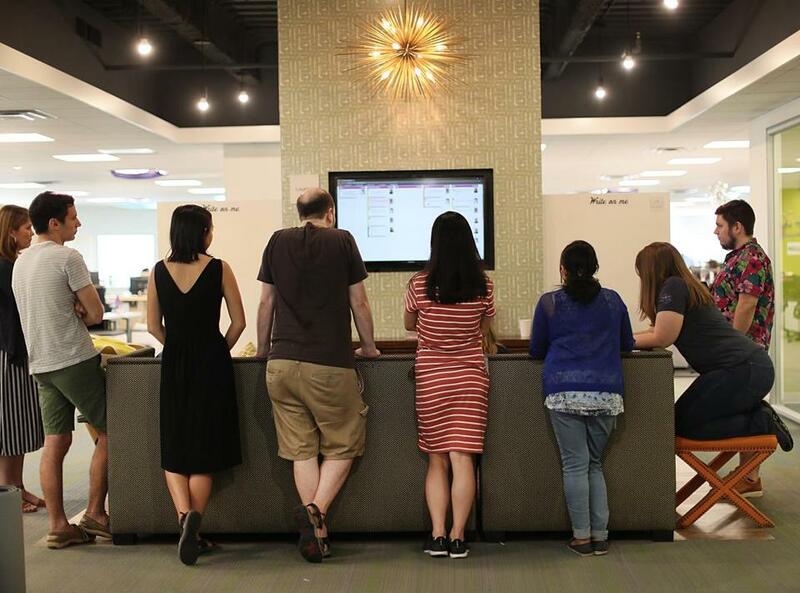 Every Monday, new employees stream up the escalators of Wayfair’s Copley Place headquarters for orientation. On a mid-July Monday, the class of hires had hit 205, a record for the online seller of home goods. Row after row of mostly bright-faced twentysomethings, fresh with degrees in computer science or marketing, seemed to stretch on endlessly, as if they were caught between mirrored walls. It was high-minded rhetoric for a company that sells couches, lamps, cat condos, and other home furnishings — but it’s hard to argue with success. Wayfair has become a colossus since it was launched in a spare bedroom of cofounder Steve Conine’s Boston home in 2002: It has five popular branded websites stocked with some 10 million products, sales that are forecast to hit $6.6 billion this year, and a stock market value of $10 billion, making Wayfair one of the largest publicly traded companies in Massachusetts. Employees at work at Wayfair. Wayfair is also on a shopping spree of its own — for people and for office space. It added about 2,000 employees in the first half of this year, and its headcount is approaching 10,000. The company is rapidly outgrowing its headquarters and next year will expand into a nearby building with space for another 4,000 employees. Wayfair’s stock has made Conine and cofounder Niraj Shah billionaires. But they aren’t coasting, approaching work as if Wayfair was still in its early stages, charting a course to dominate the $600 billion global home furnishings market. That they have done, but there is one important missing piece: profit. The more Wayfair sells, the more it loses money. The company reported a net loss of nearly $245 million in 2017, yet is doubling down on a business plan that emphasizes growth over profit. Now in their mid-40s, Conine and Shah met at a math and engineering camp in high school, then ended up in the same dorm as freshmen at Cornell University. They run the company together as cochairmen, each taking a nominal annual salary of $80,000. Shah is also chief executive and, as a rule, does more of the talking; friends say he fancies himself a bit of a design buff. With untucked shirts and tussled hair, Conine is more laid-back; he plays in bands and paddleboards on the Charles River. Shah has memorized the page numbers of investor presentations, while Conine is at heart a tech nerd and data geek. After college, they started two digital businesses before launching their first online store, a site that supplied furniture for stereo equipment that they called racksandstands.com. Eventually, their company, CSN Stores, would run a constellation of some 250 housewares sites that shipped orders directly from suppliers. Nearly a decade in, CSN was doing $500 million in sales with zero inventory or outside investment. But Conine and Shah realized they needed a single brand to go toe-to-toe with Walmart, Target, or Home Depot. So in 2011, the duo consolidated everygrandfatherclock.com, allroosterdecor.com, and scores of other sites under one simple name: Wayfair.com. Arguably, selling furniture online is unlike any other e-commerce transaction, said Steven Dennis, a former top executive at Neiman Marcus and now a retail adviser for SageBerry Consulting. Unlike apparel or groceries, furniture is big, bulky, and easily damaged during delivery. There are hundreds of anonymous manufacturers, and with so many products at every available price point, it’s hard for one retailer to stand out. 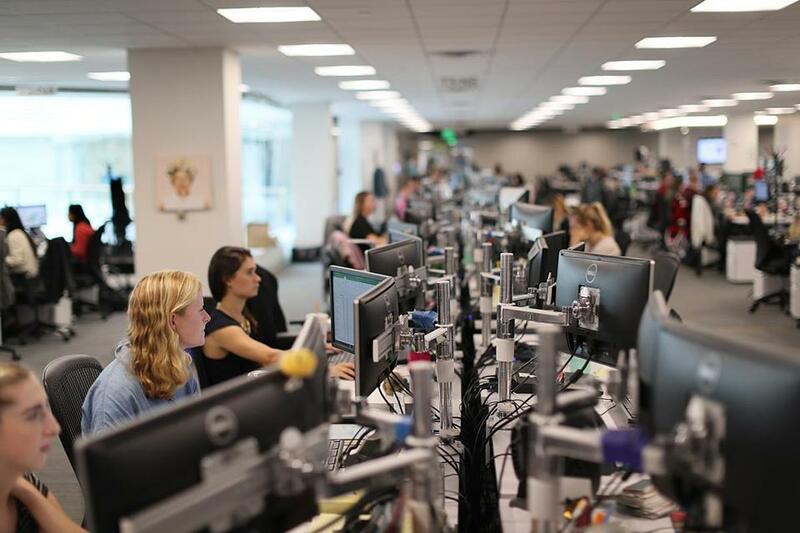 Wayfair is one of the rare local tech companies to strike it big in the consumer world, but it didn’t get this far by hiring interior decorators or fashion designers. The company is full of data geeks whose metrics happen to be on the sales of couches, curtains and the like, and it recruits MBA graduates and PhD students in data science. A standing meeting at the headquarters of Wayfair. Conine said a customer searching for a brown leather sectional, for example, is probably embarking on a renovation project and can become a more valuable customer whom Wayfair will target with ads. The company has built technology to allow customers to upload photos — of a green velvet sofa, for example — to find similar ones, and its augmented reality and virtual reality tools render furniture in 3-D or let a customer see how a love seat will fit in the living room. 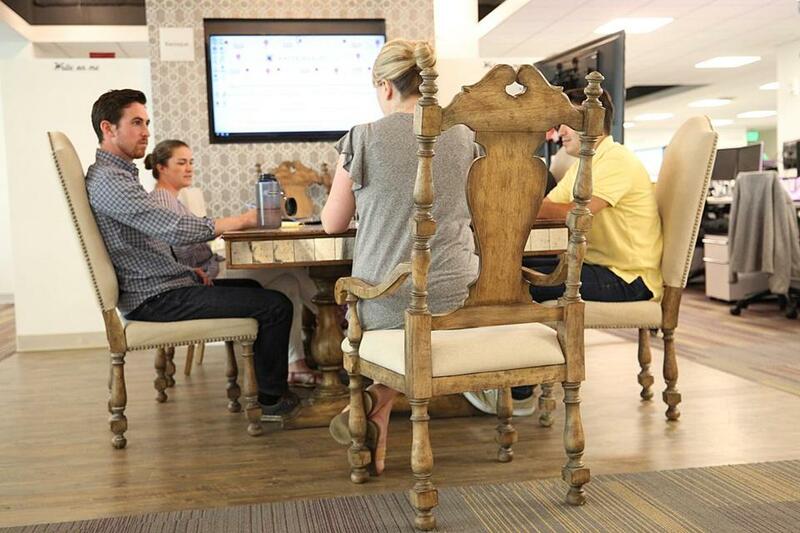 At Boston-based Wayfair, staff meetings often take place on furniture the company sells. Wayfair is increasingly vying against some of biggest names in retail: Home Depot last year purchased the Company Store, offering bedding and textiles to complement its vanities and hardware. Walmart’s home offerings online now feature virtual tours and “Buy the Room” options. Target acquired a shipping service for home deliveries, and Houzz, the home-design platform that connects customers with contractors, interior designers, and retailers, bulked up with $400 million in funding last year. And then there is Amazon. The online giant more than tripled its furniture sales to $4 billion from 2015 to 2017, according to One Click Retail. It now has two private-label brands, Rivet and Stone & Beam. By this stage in their careers, Shah and Conine have heard the Amazon comparisons so often they have a ready answer: Amazon, Shah sniffed, isn’t as dedicated to home goods as Wayfair is. Yet Amazon serves as a helpful comparison for one of the main criticisms they face: that they lack profitability. Like Amazon, Wayfair is spending heavily on its growth plan, building out its warehouse and shipping capacity, expanding into more markets, and building its brand name with seemingly ubiquitous television ads. As Jeff Naylor, a Wayfair board member who is the former chief financial officer of TJX Cos., pointedly noted, Amazon didn’t make money for many of its early years. Wall Street certainly seems to agree: The company’s shares have appreciated about 42 percent a year, on average, since going public in October 2014, significantly better than the returns of major stock indexes. But a few in the investment community wonder about all those losses. Still, the steady increase in revenue quarter after quarter has helped drive the stock ever higher, as many on Wall Street believe Wayfair is following the Amazon playbook for growth and will turn a profit within a few years. Some investors may also see Wayfair as a potential acquisition target, by Amazon or Walmart, while others believe Wayfair should be doing the buying, of a struggling bricks-and-mortar brand like Bed, Bath & Beyond, perhaps. Inside Wayfair, they talk of what “she” wants. Whether designing a Web page, picking a product mix, building an online showroom, or planning an ad campaign, employees are exhorted to channel the mind of an archetypal customer: a home-obsessed woman. “She,” said Liza Lefkowski, Wayfair’s head of global branding, is actually one woman at different points of her life: a young working professional focusing on her growing family and home and an older woman “living her best life” and more focused on herself. Wayfair’s goal is to make the online experience for both as painless as possible — so that they will shop as often as possible. There is another “she,” one who has barely begun to shop. This is the big bet Shah and Conine are making: The huge losses incurred investing in the company will be repaid many fold when some 80 million millennials — women and men — settle into their own homes and begin shopping in earnest. “The millennials are about to age into the demographic. That’s part of the big upside,” Shah said. “When you start to think about how big the online opportunity is here, it’s huge,” he said. There are other outstanding questions as Wayfair continues to scale up: Is the company doing enough to create loyalty — and spur repeat purchases — among customers? Will Wayfair open bricks-and-mortar stores? How would it fare during a recession? Wayfair spent more than a half-billion dollars on advertising last year and is poised to blow past that amount in 2018. Ben Row, a former Apple executive who now works for the Boston-based retail software maker BigTinCan, said Wayfair’s ads remind him of “Kmart commercials two decades ago,” goofy, jingle-heavy pitches that aren’t much better or fresher today than they were back then. He said Wayfair needs to more seriously sell customers on its strengths: design taste, breadth of offerings, and prompt service. Lefkowski said Wayfair has new ads coming this fall that will feel more personal. Whether that personal touch will include a traditional store remains unclear. Wayfair plans to open an outlet store near its warehouse in Kentucky that will sell returned items in good condition, but otherwise has no immediate plans for a retail storefront. Conine and Shah said it would be impossible to have a store fully represent the breadth of Wayfair’s enormous product offerings. As for a recession, Conine said Wayfair could even benefit during a downturn, as customers become more price-sensitive. “You actually capture market share faster,” Conine said. That kind of confidence from Conine and Shah is not new. Their friend and investor Neeraj Agrawal sounds slightly awed at how much the pair, who both have young children, juggle and have achieved. 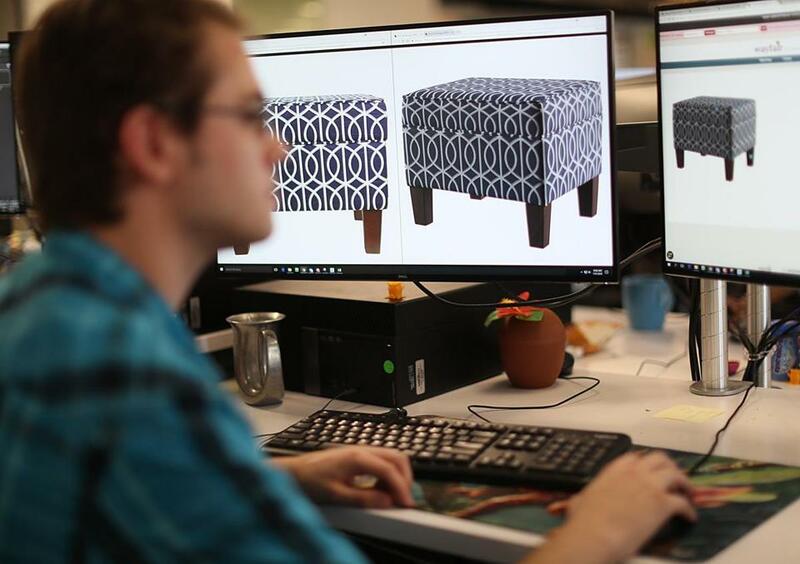 Jay deVeer, a 3-D artist, was at work on images of furniture.